...And after a long time the boy came back again. "I am sorry, Boy," said the tree, "but I have nothing left to give you- My apples are gone." "My branches are gone," said the tree. "You cannot swing on them-"
"My trunk is gone," said the tree. "You cannot climb-"
"I am sorry," sighed the tree. "I wish that I could give you something... but I have nothing left. I am an old stump. I am sorry..."
"Well," said the tree, straightening herself up as much as she could, "An old stump is good for sitting and resting. Come, Boy, sit down. Sit down and rest." Oh Jo.... I started tearing up. Goosebumps. So deeply moved. And I hold so much reverence for Taoism too. This post. Was. Beautifully Authentic. Your soul shines through so brightly! I am DYING! 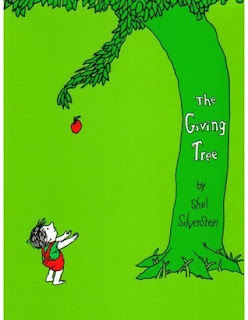 I just shared a link on Facebook where a favorite blogger of mine sarcastically reviews "The Giving Tree" and "I'll Love You Forever". I have such a love/hate relationship with these books. I remember my mom sniffling (and sobbing at times) her way through them when I was a kid. As an adult, I can't read either to a child without doing the same thing. It's a hard thing to explain to a kid, and probably a bit awkward for them. But...*sigh*...aren't all the great lessons in this life awkward at first but then amazingly sob inducing in the end?